It is a great feeling when a member of your community is presented with an award but that great feeling increases when it is a member that works so closely with our children. 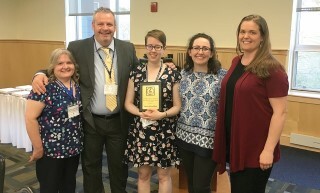 Hanna Flewelling, orchestra and band instructor at Windham High School was recently presented with the Maine New Music Educator of the Year Award this past month at the President's Reception of the Maine Music Educators Conference at the University of Maine. Each year The Maine Music Educators Association (MMEA) awards a teacher with no more than five years of teaching experience with this award. “The award recognizes an educator who shows outstanding potential and is already making a difference,” said Richard Nickerson, Director of Choral Activities at the Windham High School. The teacher then has to be nominated by a member of the MMEA or by an administrator. Flewelling demonstrated all these qualities and did so with flair. “Since arriving at Windham High School, Hanna has shown an infectious enthusiasm towards teaching,” said Nickerson. “The numbers for orchestra have doubled in the past 4 years.” Nickerson presented Flewelling with this award at the MMEA conference. Flewelling, who has been the orchestra instructor at the high school, recently took on the role of band instructor following the retirement of the previous long-time band instructor. While taking on this additional role, Flewelling has thrived and is making a difference in the high school students she works with everyday along with the younger students as well. “She is a team player who always puts the needs of her students first,” said Nickerson. Congratulations, Hanna! Thank you for your hard work for the students of RSU 14.